On the wet, misty morning of May 6th, the regiment moved out on the offensive again. Three battalions abreast, the regiment advanced eastward to the day’s objective, Falkenau. The 1st Battalion pushed on against little resistance until noon. Two thousand yards east of Vildštejn, however, B Company struck a detachment of battle-hardened German marines from the pocket battleship Admiral Scheer. The marines put up a fierce resistance, inflicting twenty casualties, including one officer and three enlisted men who were killed. The 2nd Battalion had one killed and seven wounded that day. To the south, the 3rd Battalion advanced with no resistance, taking a few prisoners from each small town until Kulsam was reached. There, the enemy was determined not to give up a bridge (which had not yet been destroyed) without a fight. K Company “came under grazing automatic fire and was pinned down” but managed to seize the bridge and remove all demolition charges before the bridge could be blown. By the end of the day, the regiment was still fifteen kilometers away from its objective and had suffered a total of fifty-one killed, wounded or missing in action. As it turned out, these were the last battle casualties of the war for the 16th Infantry. 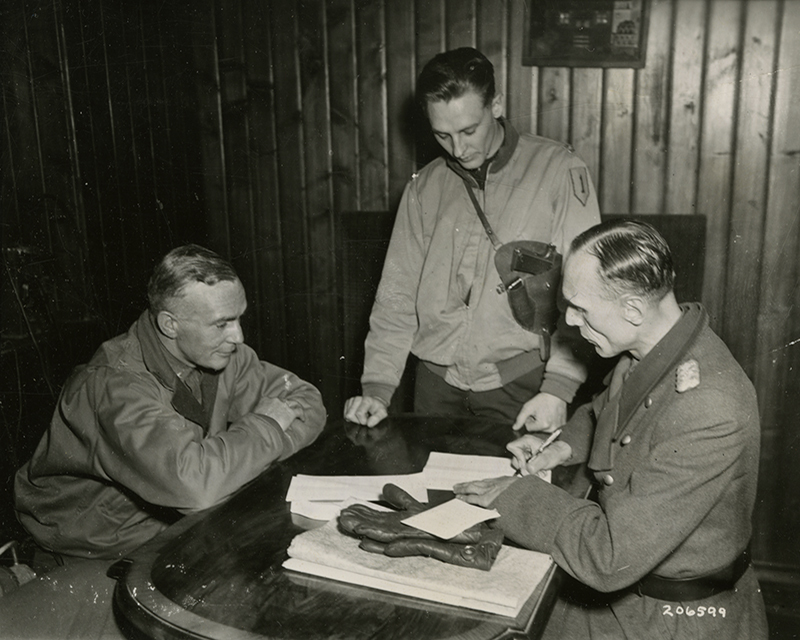 Lieutenant General Fritz Benicke, commander of German forces in and around Elbogen, Czechoslovakia, signs surrender papers for troops and equipment under his command. But not all the men got through the war unscathed. In 443 days of combat, the 16th Infantry lost more than 1,300 officers and enlisted men. Over five times that number were wounded or missing in action. The regiment saw combat in the extreme heat of North Africa and had braved the bitter cold and snow during the Battle of the Bulge. It fought its way through the hedgerows of Normandy, breached the vaunted Siegfried Line and faced tough opposition in the dense, rugged terrain of the Hürtgen Forest. In the process, five 16th Infantrymen earned the Medal of Honor, and 92 received the Distinguished Service Cross. Countless Silver and Bronze Star medals were awarded. In short, the 16th Infantry ended the war with a record few, if any, other American regiments in World War II could match. Now, with the end of hostilities in Europe, the regiment would have to keep the peace in a postwar Germany, continuing its tradition of service to the nation.